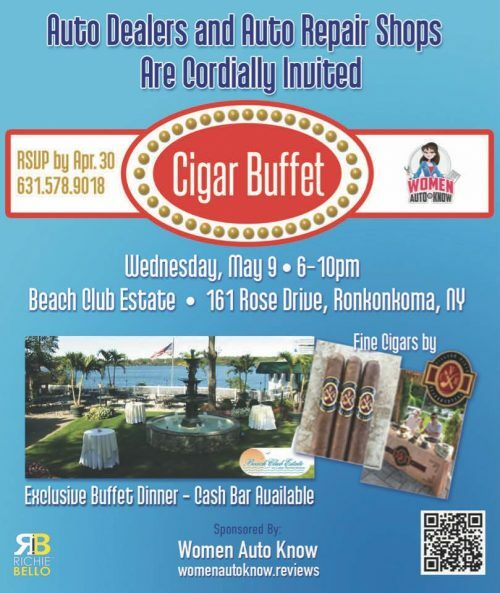 Richie Bello and WomenAutoKnow.Reviews have announced their Cigar Buffet Dinner scheduled for May 9, 2018 from 6:00 PM to 10:00 PM to be held at the luxurious Beach Club Estate located at 161 Rose Drive in Ronkonkoma, New York. This event is open to Car Dealers and Auto Repair Shop operators who RSVP before April 30, 2018 by calling (631) 578-9018. Bello went on to state, “This is a great opportunity for every auto dealer to motivate their staff, just in time for this year’s upcoming selling season... Money is not the only motivator in automotive sales, your people need to be motivated on a more engaging level in order to achieve the results your dealership needs.” Attending the event requires a brief RSVP phone call reservation by April 30th to (631) 578-9018. 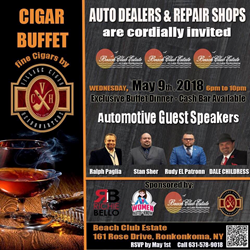 Sponsors of the Richie Bello Cigar Buffet include WomenAutoKnow.reviews, the Richie Bello organization and Fine Cigars by Village Cigar Headquarters.